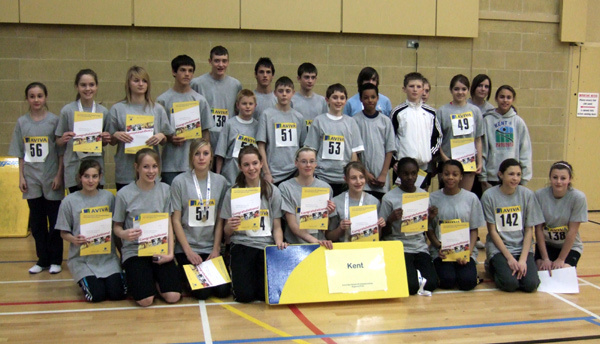 Congratulations to all those who took part for Kent in the South East Regional Finals at Burgess Hill on Sunday. Competing against Hampshire, Berkshire, Surrey, Sussex, Oxfordshire, Buckinghamshire and the Channel Islands. Dina Asher-Smith (Blackheath and Bromley) won three Gold Medals in the U/13 competition. She won the Standing Long Jump 2.38m, the 4 Lap race and with Abigail Purkis (Ashford) took Gold in the 8 lap paarlauf. Lauren Bamford (Ashford) won Silver in the Speed Bounce with 82 bounces and Elizabeth Highwood (Ashford) won Silver in the Shot 7.58m. The team finished 4th. In the U/13 boys Nick Armstrong (Bexley) won the High Jump 1.50m, with Lewis Church (Sevenoaks) just missing out on the Bronze Medal on count back, jumped 1.45m a PB. Elyas Sadighi (MKA Panthers) won Bronze in the Shot 9.02m, James Brunger (MKA Panthers) finished in Bronze Medal position in the Speed Bounce 73 Bounces. The team finished 6th. No medals were won in the U/15 boys hotly contended all rounder competition. Jacob Burton (Thanet Road Runners) who stepped up to extra events to cover illness from another team member came close to winning Bronze in the Standing Triple Jump coming 4th with 7.64m. Jacob was the highest placed Kent Athlete in the overall standings =15th place with brother Ben in =17th place just one point between them. Lucy Holmes (Ashford) won the U/15 girls only Medal in the Speed Bounce 84 Bounces. Shanique Joseph claimed two 4th places, the vertical Jump 62 and the 4 lap race. Shanique was the highest placed Kent athlete in 11th place, Lucy Holmes came =12 and Laura Hanagan 14th. The team finished 4th. Thanks to all those who helped on the day.